Heather and Jude met and fell in love in college, where they built a foundation that sustained them through five years of very long distance dating: Heather's career took her to New York City, while Jude was living across the Atlantic in France! "As difficult as it was, Heather recalls, "I wouldn't change anything about that time in our relationship, because we learned to communicate and appreciate our time together in new ways." When they finally got engaged on a cloudy Sunday morning on a beach in Florida, they had been together for seven years, Heather was on her way to becoming Catholic, and it was clear that the Lord had beautiful things in store for this faithful couple. From the Bride: We were engaged for 11 months, during which we relocated to the South to be closer to our families and I attended RCIA in order to be fully received into the Catholic Church. I was actually confirmed on the night of our wedding rehearsal, with all of our closest friends and family present. The next day, we were married in our hometown of Fairhope, AL at the prettiest little chapel called Sacred Heart. For the ceremony, Roman Street played acoustic guitars as we arrived at the chapel. Jubilee Flowers created a gorgeous garland that arched the doorway with roses and other blooms. My father walked me down the aisle, telling funny jokes along the way, where we met my family, family-to-be, and Father Boni. 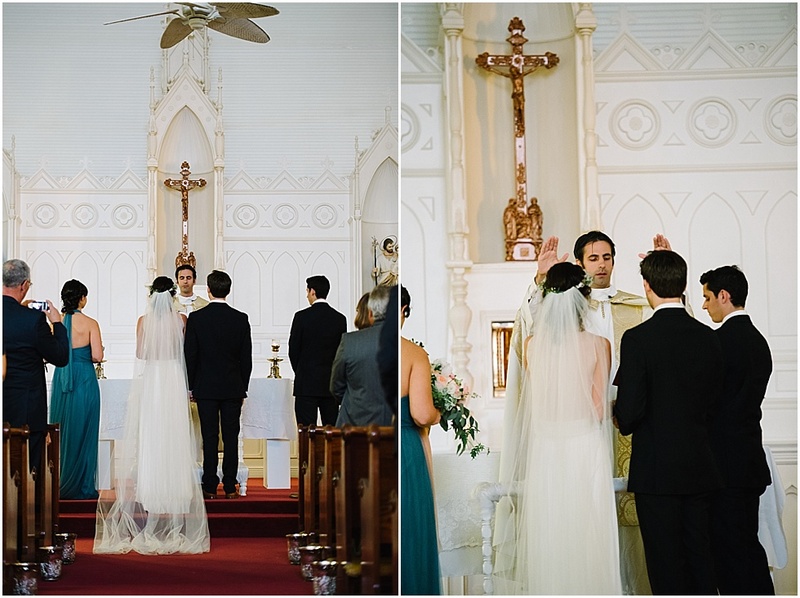 With a chapel full of loved ones, the ceremony was as personal as it was spiritual. The sun was setting over the bay just as everyone exited the chapel, setting the perfect tone for our casual-yet-romantic reception. The reception was held at a beautiful event space in downtown Fairhope called The Venue. Jude and I enjoyed our first dance together to the song "Only You" by Yaz while my dad and I shared a dance to Roman Street's cover of "My Girl" by The Temptations. The food was a combination of Southern-inspired dishes with a flair of Creole spice, and the cake was made by local cake artist Jan Taylor. A sparkler exit sent us on our way at the end of the evening. My dress was a two-piece ensemble, which included a custom crop top by Kelly Faetanini and silk chiffon skirt by Catherine Deane. My cathedral veil was made by the team at Kleinfeld. My talented cousin Mary of One Suite Day created our custom invitations, programs, and signage and Brad Burckel of Du Castel Photography captured everything through the weekend perfectly. Heather's spiritual takeaway from her wedding day: Being married traditionally in a church was very important to my husband and me, and I'm so thankful we were able to have a wedding in the way that we did. We put God at the center of our planning process and He blessed us with perfect 75 degree weather, a brilliant sunset, safe travels for everyone who came from so far away, and much more. It's easy to get caught up in all the details of a wedding, but we did our best to focus on our purpose and people, and I wouldn't have had it any other way.